I almost got in a fight with Lady GaGa today. So earlier this evening, I got to be an extra in one of GnomeAir Halostar‘s machinimas. When the call went out for extras in the actor group, someone asked what we were supposed to wear. GnomeAir said that if we had vampire stuff, cool, and if not, just come as we were. I happened to be already wearing one of my favorite dresses from Mischief, so I figured it was good enough. I was a little surprised at the girl who decided to come in …. well, I don’t know what that lingerie mess was supposed to be. Or how it related to the story. 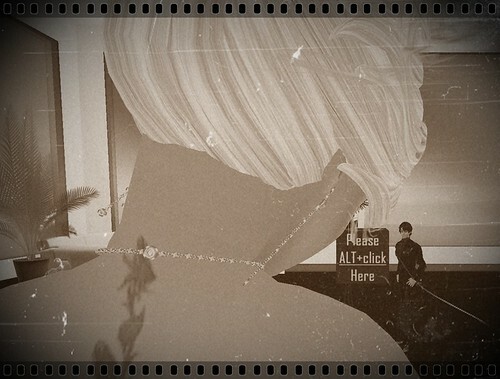 Oh, pay close attention to the other blonde girl in the ugly black dress. The woman in the pink hair is Ravenelle, and she was to be like Willy Wonka’s great granddaughter because for some reason, this “Twilight” inspired story [Breaking Dawn, actually] took place in Wonka’s chocolate factory. I don’t know either, but like GnomeAir said, it’s all in the editing. So. We get in there and we’re on bikes and we’re supposed to be flipping and jumping all over the place while GnomeAir as Bella gives birth. And that’s when I get IMed. [18:46] LadyGaGa V—-: why are you copying me? Remember how I said to pay attention to the girl in the ugly black dress? Yeah. That’s Lady GaGa. Why am I copying HER – even though SHE couldn’t come up with ANYTHING more original than Lady Freakin’ GaGa? Yeahhh. [18:46] Alicia Chenaux: copying what? i’m laggeed out, i barely see anyone. [18:47] Alicia Chenaux: Uh, no? [18:48] Alicia Chenaux: Trust me, I always know what I look like. YOU change if you have such an issue with it. What kind of person IMs someone in the middle of a REALLY lagged out filming area and asks them to change? I’ll tell you what kind. The attention whore kind. [18:51] GnomeAir Halostar: anybody close to edward to change me? I guess to shut her up, she got to be Edward. And so she could figure out who she was, she took her skirt off. Yes. This is the girl who thinks she looks SO much like me, she won’t be able to figure out who she is in the movie. Anyway, it was really a lot of fun, and I was totally happy to do it. Here’s a pic of the cast at the end. The video should be posted on Sunday evening, so I’ll post it here when it is. So because Sophia yelled at me for not blogging the original one, here’s the ad I am in for Phoenix Rising. I think it’s pretty! I thought the first was pretty too, though. But I ended up at the Thursday Night Dance Party at Rouge. What can I say? It’s way more fun than cleaning. Day 113 – Fabulous, darling! I grabbed a few more shots after the show. I apologize for the low quality, I had my settings turned down so that I wouldn’t crash. Big thanks to Eboni for allowing me to model for her!! 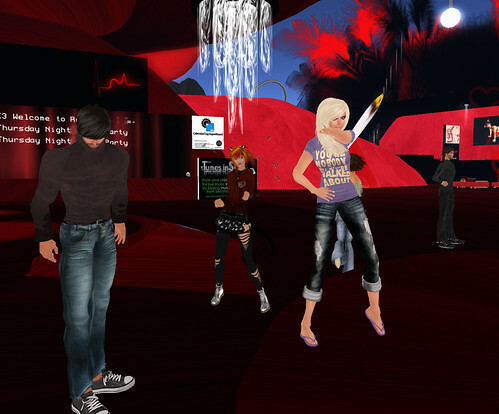 Fabulous Fashion shoots every Monday at 6pm SLT. It’s truly a fun experience, and I highly suggest you check it out! Good day today. A pleasant change after yesterday. How-freakin’-ever…I lost my voice this afternoon. Do you guys know how BAD that is for me?? I’m chit-chatting allll day long, singing, humming, laughing. As quiet as I appear in-world, I’m actually quite chatty in my physical world on a daily basis. Not being able to talk…so bad. LOL My throat doesn’t hurt a bit, and I was talking fine this morning, I just don’t know what happened. Now I can whisper and squeak. Anyway, I do have loads to talk about, but I’ll wait until tomorrow or Sunday. So what’s happening Friday? 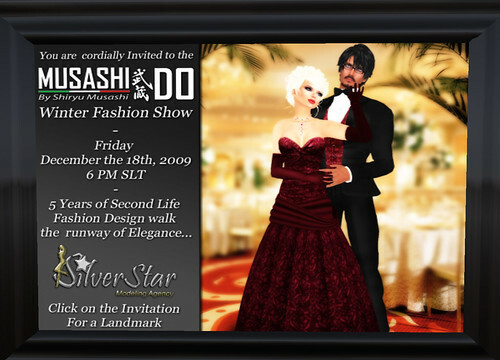 The Musashi-Do fashion show! I’m walking in this one and DJing it. I know, he’s a total slavedriver. :-p I’m actually really starting to like doing runway shows. I was quite happy as just a live or print model, but runway is just fun. Plus the models for SilverStar are AWESOME and they keep me laughing the whole time we’re doing shows. I kinda think I should wear this hair for the show. Think I can get away with it? That’s hair from Tukinowaguma. Darn that Emerald for talking about it one day. LOL! The hair over there is just so NUTS. I love it. Speaking of Emerald, she passed me something last night because she wanted me to look gangsta with her and Heidi. My friend Gwendolyn asked me to DJ an ice skating party over on her sim, Hallelujah Azul, tonight at 6pm. It should be nice. I’ll be doing jazz, soft pop, and holiday tunes. That’s always fun for me, to play all the pretty love songs that I adore. 🙂 You guys should come out, there will be gifts and Santa! I better get back to doing stuff. The show should be up tomorrow afternoon, so I’ll be able to post it here when it is.